Only for Prepaid Airtel Online Recharge.Not for Post Paid Airtel Bill payment, Airtel D2H recharge & airtel broadband biils. Get 3% CashBack Rewards on Prepaid Airtel Online Recharge. Applicable only for Mobile Prepaid recharge. Earn extra cashbacks every time..
CashMint helps you to save in mobile recharges too, India’s top website for Cashback and Coupons. It is India’s leading online website that features 500 plus online shopping websites only to help you save maximum every time you online recharge your mobile phones in India. Join Cashmint.in to get Coupons + extra cashbacks exclusively. If you are an Airtel user, Cashmint.in gives you another reason to cheer and add happiness to your online shopping need. Recharge your Airtel number via Cashmint.in and get an assured 4% Cashback on all recharges done at Airtel Online Recharge. Cashmint.in is your only destination to avail extra savings every time you recharge your mobile phones in India. 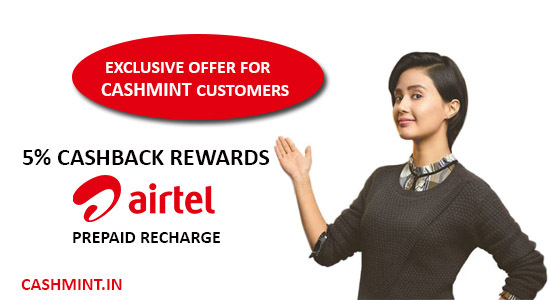 Airtel Mobile Recharge via CashMint gives you extra benefits. • Login Cashmint.in and Find the Airtel page listed at our website. • Select your favourite Airtel Discount Coupons and Airtel offers from Cashmint.in. • After you have found the best Airtel deal for yourself, we’ll surprise you with Exclusive Discount Coupons, so that you can save big on your purchase. • Visit Airtel Online Recharge website via Cashmint.in. • Just when you think that you have the best Airtel Coupons, we’ll provide you with 4% Extra Cashback. Your Cashback amount gets confirmed to your Cashmint account within 72 hours. As soon as you receive Rs.200 confirmed Cashback, you can request for payments of your entire cashback amount through cheque or bank transfer. It usually takes 8-10 days for Cashmint.in to process your cashback amount directly to your bank account. This is not just end, apart from airtel online recharge you can also availpaytm coupons codes and pay through paytm as well. Why Cashmint.in is the best way to recharge your mobiles? CashMint is the Best Cash back and coupons site that offers exclusively 4% cashback for Airtel Recharge. We have a good team to assist you in all needs. For any support you needed from Airtel, Then just dial Airtel Customer care number 121 from your airtel number.